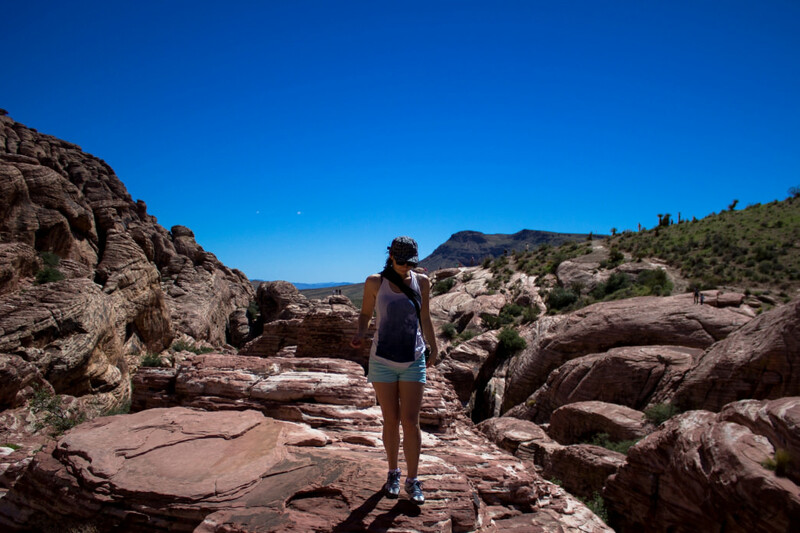 Red Rock Canyon is located a mere 17 miles from the famous Las Vegas Strip, meaning that theoretically, you could party till dawn and be on the trail in just a half an hour. The most popular part of the area is the Scenic Loop, a 13 mile one-way drive with opportunities for hiking, climbing, and snapping legendary Instagram shots all along the way. This is the only part of Red Rock Canyon that has official hours (these change depending on the time of year), so make yourself aware of them before you go. The Scenic Loop also charges a small entrance fee, but if you already have an annual pass for the national parks, you’re good to go. The 200,000 acre Red Rock Canyon National Conservation Area is located in the Spring Mountains, home to a surprising amount of natural springs, tinajas, and waterfalls. The sandstone and limestone cliffs give the rock its stunning red appearance. Elevations fluctuate between 3,000 and 6,000 feet, meaning that while you can expect it to be a few degrees cooler than it is under the neon canopy on Fremont Street, you should still expect summer temperatures to reach 110 degrees, making this a destination best suited for fall or spring. 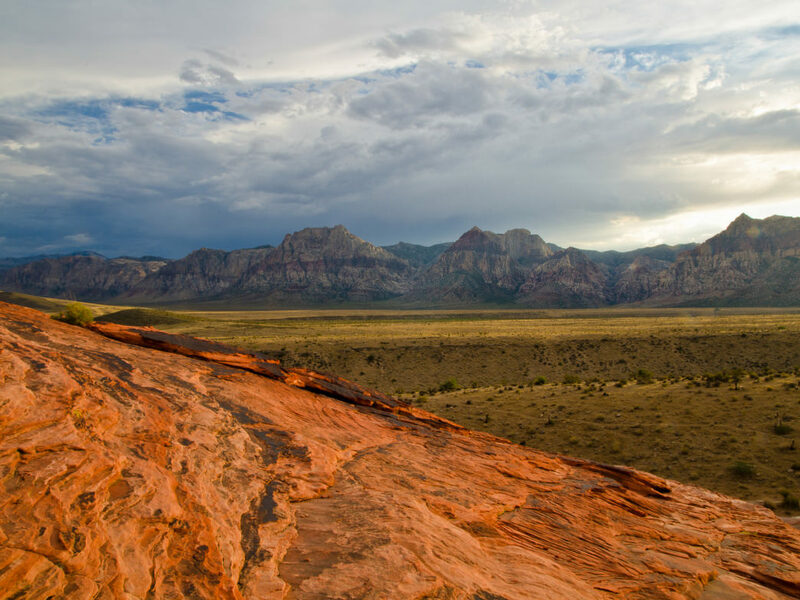 Red Rock Canyon is one of the best rock climbing spots in the country, period. You could spend years there and only climb a fraction of the 2,066 routes, which range from short sport routes to 20 pitch trad routes. The majority of routes are 5.10, but ratings range from 5.0 to 5.14, so novices and experts alike will find something to love. 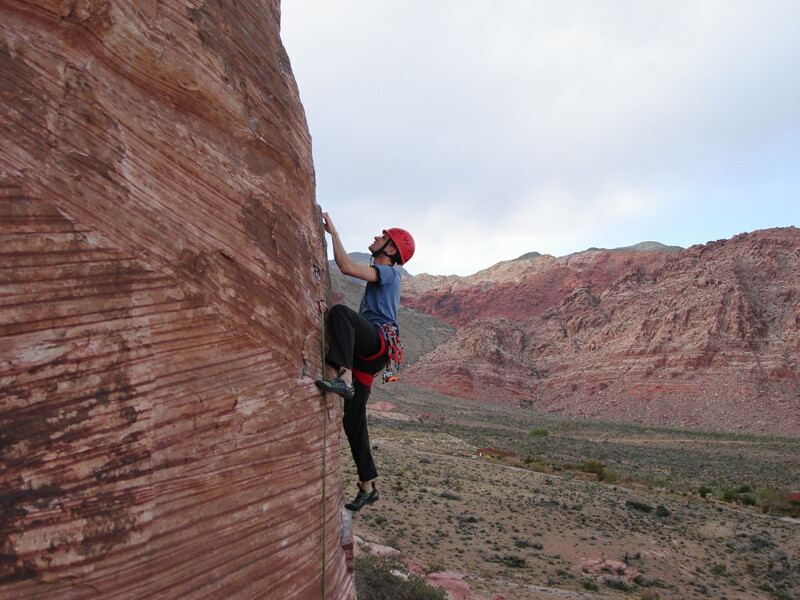 The unique type of sandstone in Red Rock Canyon, known as Aztec sandstone, is typically harder and therefore easier on climbers than other types of sandstone, but it can still be crumbly, so it’s recommended that you warm up on something easy to get a feel for the rock. You should also be sure to avoid climbing within 24 hours of rain, as this is dangerous for you and dangerous for the holds on the rock. 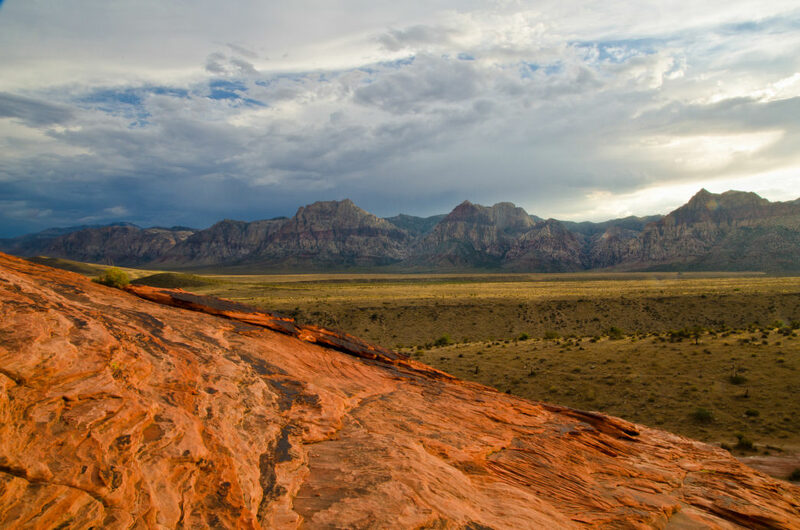 Because it’s easy to get overwhelmed by the number of sport routes, trad routes, and bouldering problems in Red Rock Canyon, a dedicated climbing staff is available at the visitor center with route descriptions, photos, and other resources. Most of the routes start from the Scenic Loop, which can close as early as 5pm, but late exit permits are available and will give you two hours of extra climbing time. You can also get an overnight bivi permit for super long routes, like the ones on Mt. Wilson, Rainbow Wall, Bridge Mountain, Hidden Wall, Buffalo Wall, and Levitation Wall. If one glance at those red and white sandstone mountains doesn’t have you lacing up your hiking boots, we don’t know what will. The mere fact that you can stroll through crimson canyons to desert springs just moments from Sin City is nothing short of a miracle. Trails in Red Rock Canyon range from casual walks to tough scrambles. Many hikes will only take up an hour or two of your time, which is perfect if you’re hiking in the summer and looking to take advantage of cooler morning temperatures or if you’re a local in need of some outside exercise after work. To the uninitiated, the desert often seems like a barren landscape, a dull horizon where views look the same no matter which direction you’re facing. But if you love the desert, you know that that’s not true. Red Rock Canyon is a classic example of this. The area’s hikes offer secret springs, old ruins and a chance to walk beside bighorn sheep, burros, and wild mustangs. Pine Creek Canyon, for example, is a 2-mile hike with a stop at an old homestead nestled in a dreamy meadow dotted with ponderosa pines. Turtlehead Peak, a 5-mile round trip scramble that gains 2,000 feet in elevation, rises to a windswept summit overlooking Las Vegas. Ice Box Canyon, a 3-mile trip, takes you through a high walled canyon that stays cool year round and ends at the base of a seasonal waterfall. And if you want desert vistas, the Base of the Escarpment Trail will take you on a 10-mile journey where you’ll witness the 3,000 feet of vertical relief at the cliffs above up close. Red Rock’s only campground is located two miles from the visitor center outside of the Scenic Loop and just off of SR-159. It has 72 sites and is closed in the summer. Fortunately, if you’re visiting between May and September or feel like allowing yourself the indulgence of an actual bed in between long days of climbing, you’ll have plenty of options. 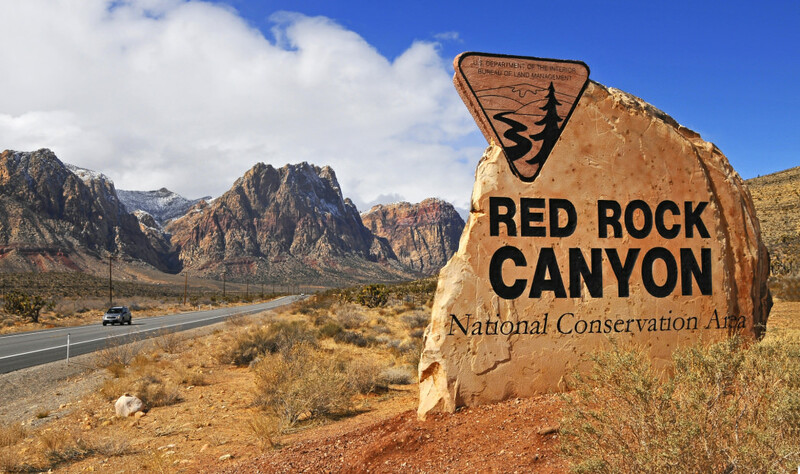 Where else but Red Rock Canyon can you spend your days hiking and your nights eating five star meals, bar hopping, and taking in Cirque du Soleil shows? If you’re looking for luxury accommodations, consider the appropriately named Red Rock Casino, home to a slew of great restaurants, spa services, and one of the most oasis-like pools in the city. If you’re planning on bringing your pooch to the crag and need a dog-friendly hotel, consider the La Quinta Red Rock/Summerlin. 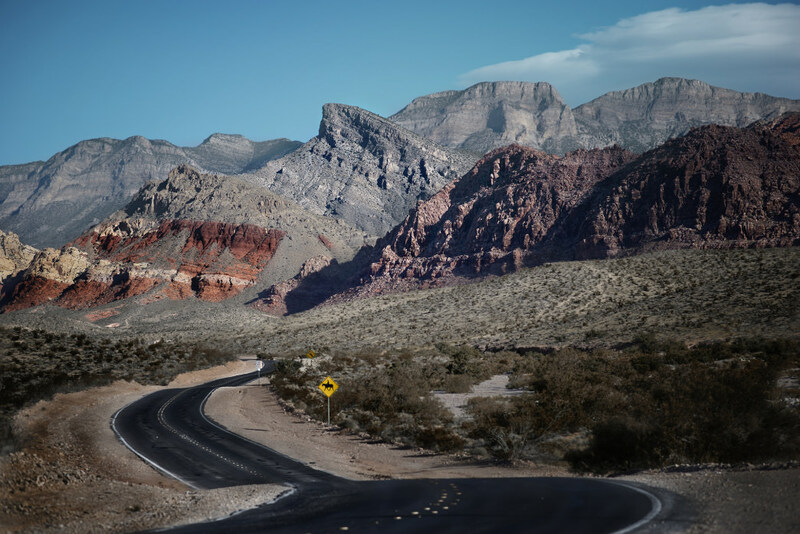 Both options are about a 10 minute drive from Red Rock Canyon, and are located in the beautiful neighborhood of Summerlin, where 24 hour grocery stores, an REI, a local climbing store, and a bustling downtown area are all at your fingertips. But of course, if you really want to go big or go home, book a surprisingly cheap room on the Las Vegas Strip or in fabulous Downtown Las Vegas. The former offers glitz, glamour, and famous DJ’s with residencies at massive nightclubs and the latter offers hipster bars and a vintage Vegas feel. Whichever option you choose, there’s nothing like the feeling of waking up, walking through a casino, and driving out of the chaos of the craziest city on earth and into the wilderness. The juxtaposition between the neon and the wilderness never fails to amaze.